The world-famous mashup party comes to Vegas to mash up the ‘70s, ‘80s, & ‘90s with everything, including current hits! For over a decade, Bootie – the world-famous mashup party – has been spreading mashup culture around the globe. 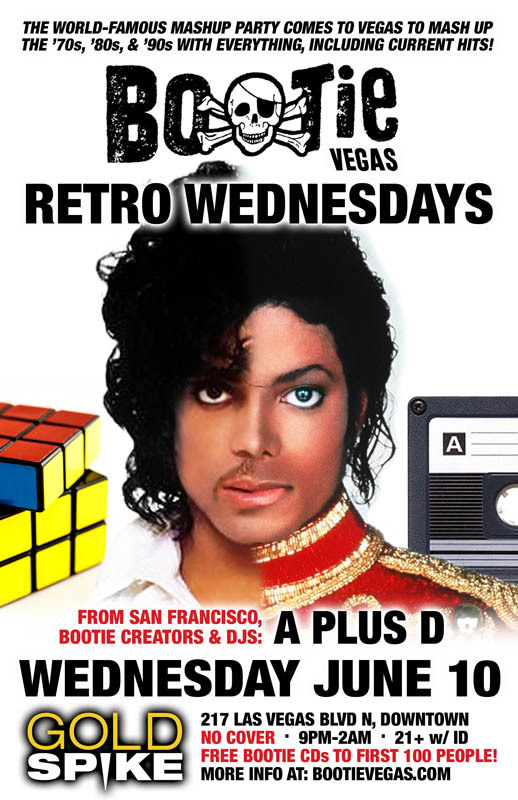 Now, the party finally comes to Las Vegas every second Wednesday, as part of Gold Spike’s “Retro Wednesdays,” bringing the best music from the ‘70s, ‘80s, & ‘90s – and mashing it up with anything and everything, including current hits! From San Francisco, Bootie creators and DJs A Plus D will mix and mash the best retro music from every genre, combining them with songs from every era, all night long! Settling in at downtown’s newly-renovated Gold Spike, Bootie pulls out all the stops for a cover-free mashstravaganza! It’s your favorite music from right now and way back when, all in the same song! Dress in your retro best, or come as you are — just come ready to dance!